Uniformity has always been a challenge for process modellers, with a proliferation of tools & standards historically available. Receive comprehensive training on BPMN 2.0. 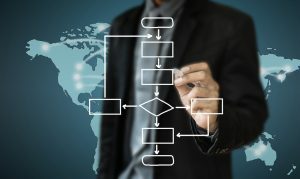 Model processes adhering to the BPMN conventions using a specialist tool. Learn through hands-on, exercise based training centred on real world business situations. Finally develop familiarity with higher-level process modelling concepts, such as the difference between maps & models, when and how to collaborate, and how process models can be interlinked. Anyone looking to develop or refresh their process modelling capabilities, in line with the latest standards. This course caters to all skill levels; no previous experience is required. If you are an experienced process modeller who is well versed in BPMN, an advanced modellers course is available on request. Maps Vs. Models – what is the difference? Note : Lunch, drinks & materials will be provided. Please ensure that you bring a laptop & charger.